The Lumia 950 and 950 XL are easily the best Lumia phones ever made, but is that enough to sell them? The best Lumia smartphones ever have just been launched in India. Microsoft’s new Lumia 950 and 950XL smartphones were launched in India and the fact that they’re better than any Lumia device launched before them, is undeniable. That said, there are two things that I couldn’t help but wonder about Microsoft’s strategy. The first quibble of course is about the pricing. While I understand the point here, pricing the phones lower than regular flagship class smartphones is a brand related problem, but from a sales point of view, it would help. Secondly, these phones just scream enterprise, and before you start denying that, let me explain. On first impressions, the Lumia 950 and 950XL are regular phones, but their true value lies in everything Windows 10 brings into the picture. Continuum features are admirable, as is Windows Hello, but if you consider the kind of user who would pay this much money for these features, you’d be hard pressed to find regular consumers. The Microsoft Display Dock, which is at the centre of the company’s continuum features, costs an additional Rs. 5,999, so the effective price for a Lumia 950 becomes nearly 50k, while the 950XL costs more than the Sony Xperia Z5. Ignoring the Android vs Windows debate, even for the Windows users, these phones make sense to a particular subset of them, and I see few Windows fans who will pay the premium to get these features, especially in India. Having said that, the improvements in the new Lumia devices cover many things that Windows fans have been waiting for forever. While the UI experience remains, the phones seemed much more responsive than what I’ve ever seen. The Snapdragon 810 and 808 are much faster than the Snapdragon 400s that Microsoft and Nokia had been pushing on Lumia phones earlier. Barring the build, the Lumia 950 and 950XL feel like flagship class devices. Perhaps the most heartening improvement is in the camera, which is much faster than what we’ve seen before. Assuming that they retain the quality that Lumia phones have always had in this department, these cameras are much more usable. The 950 and 950XL don’t focus and process images as fast as say a Nexus or Galaxy flagship, but they’re fast enough for the regular user. 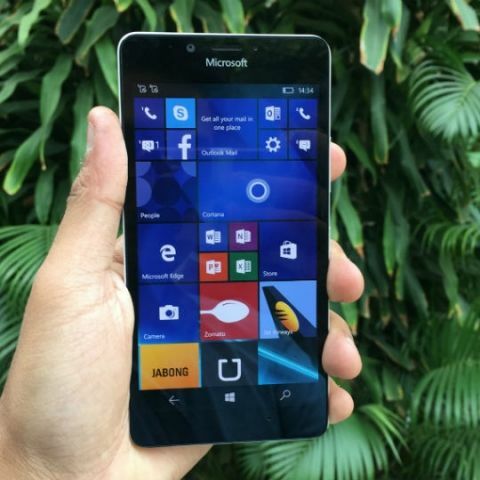 Microsoft Lumia 950 and 950XL dummy units imported, India launch soon? Another thing worth noting is that while both these phones are faster than older Lumia smartphones, there’s a noticeable difference between the 950XL and the 950. Again, the difference is small, but noticeable. Apps take perhaps only a second longer to load and open on the Lumia 950, but the difference is apparent. The flagship market in India is still small, but it’s a big value market for companies. You make more money out of selling a flagship than you do on lower budget devices. Somehow though, I don’t see these new Lumia phones to be the game changers that Microsoft has been looking for, not on first impressions at least. It’s hard to get over the fact that you’ll be paying nearly 50k for a phone that’s essentially made of plastic. Despite the fact that both the new Lumia phones feel really good, the build can’t be compared to the iPhones and Galaxy S6s of the world, which is something that puts the pricing into question once again. If you ask me whether I liked the Lumia 950 and 950XL smartphones, my answer would be an emphatic yes. Did Windows fans like them? The answer again would be an emphatic yes. That shows that Microsoft has taken a big step with these new devices. The only thing in question is the pricing, something that every OEM has had to deal with at least once in its lifetime. The new Lumias are the best Lumias ever made and there’s a lot to like.